I should disclose in advance that I'm writing this late. Very late indeed, perhaps as it's almost eleven months since this walk took place. In many ways, these months have been some of the most transformative of my entire adult life - and it's perhaps no surprise that events unfolding over the months were easier to write about than the strange days of May 2015. On 14th May, a few busy, confusing days after this walk my father died just over a year after my mother's sudden passing. It's not been my custom to write much about life at home - in fact, even huge events have only been alluded to indirectly. But this closed a chapter, and finally led to another opening. This walk, taken as a respite during a complicated time of running between home, work and hospital, was incredibly important. A fascinating route which took me into territory I'd only imagined walking - and possibly the last time I ever sent my father a message from the road, a tradition we'd followed for many years. These walks have become terribly important since May 2015, and remain so - but rarely would they represent such a strange calm time before a tumult of change. My recollections of the route are below, for completeness if nothing else. It's rare to find myself at Tower Hill these days. Indeed, it's only ever been an occasionally convenient spot for me. But today I'm going to start my walk from here, and I'm heading east - out of the city and into the dark areas of the map which used to seem so impossibly distant, so other. Of course, nowadays much of the stretch of territory along the A11 is far from alien, and slowly my knowledge of the rest of the east fills the map with light and colour - but there are areas I've never walked - maybe never dared. Areas which I've crossed and re-crossed by rail or bus, occasionally stepping off for the briefest moment to change trains or reorient myself. Today I'm walking into the unknown east, and it feels like a welcome challenge after the claustrophobic worry of the past weeks. My path leads me away from Tower Bridge, dropping beside it towards the river front and stumbling across a coffee shop stationed in the foot of the huge concrete hotel. There's something of a food festival gearing up here - street food vans are opening, fake grass is laid across the promenade like an oversize billiard table. I don't linger long, there's a walk to be done and I've only really guessed at how long it might take me to complete what feels like an ambitious route. I snap a shot back towards the bridge as I turn and head into the east, briefly along the waterfront before I'm forced inland by the discontinuous path. I pick my way around St. Katherine's Dock, dodging joggers and cyclists setting out in full lycra from the luxury apartments, and find my way onto Wapping High Street. This isn't new territory - this dark chasm of converted warehouses and river glimpses is somewhere I've touched on before - but today I walk the length of it, stopping at St. John's Churchyard and also heading to Wapping Old Stairs - the ancient hanging dock. Today it's a narrow alley which smells mildly of stale beer and disinfectant. 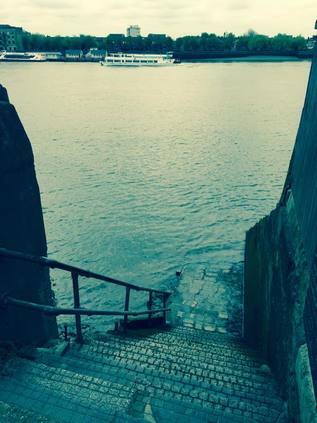 The Thames laps ponderously against the slick steps below. It's hard to imagine this as an especially dark place. Back on the High Street, I pass the station and head between buildings to New Crane Steps. 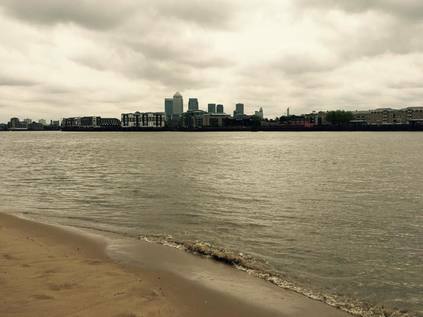 I took a picture here of a quiet, almost idyllic Thames beach years back, and I try to get the same view today. The beach is quiet and cool, and it's tempting to stay here, but I've an urge to walk on. Crossing the bascule bridge at the end of Shadwell Basin presents me with a choice - head for The Highway, or stay with the river? The day is about water - so I take a footpath leading into the King Edward VII Memorial Park and skirt the huge rotunda which ventilates the Rotherhithe Tunnel below. Back on the river, I see signs of protest - the gardens will be used as a building area for the Thames Tideway Tunnel, which will steal a section of rare green space in this part of the city, and will disrupt the river path. I edge around the barriers and obstructions already in place, and find myself in the shadow of Free Trade Wharf. This huge claw of a building climbs like a ziggurat and refuses to be photographed from close by. It is perpetually in its own shadow, and only those viewing from across the river can see it's full extent. The path is preserved at least, curving gently along the shore until I'm again forced to head inland and onto Narrow Street. I duck into Spert Street to gain a view of the Limehouse Link tunnel portal, the road delving under the basin to provide an unimpeded route onto the Isle of Dogs. I have a choice here: I could strike out along the surface describing roughly the same course to cross the top of the island, repeating a section of walk I'd completed recently, or to bend my own arbitrary rules and take to the DLR to reposition myself. Today is really two walks - neither quite long enough but together almost too ambitious? I'll take the train this time. The short DLR ride from Limehouse to Canning Town is interesting, as I'm beginning to know this territory better and can understand its complex geography from the elevation of the viaduct. Arriving at the multi-level metal and concrete confusion of Canning Town station I purchase supplies and seek out the fairly basic facilities before starting the second part of my walk. Beside the station Bow Creek slinks towards the Thames, and I'm able to confirm the rotunda offering exit from the station onto the Creek is definitely closed at present. Soon after leaving the station, I discover that Silvertown Way is a divided place - the eastern edge is being redeveloped with flats and hotels spilling north from the Royal Docks, while the western side is blighted by railways, a narrow tongue of industrial land broadening into the triangular Crossrail worksite nestled under the Lower Lea Crossing. I'd walked this way in reverse before - descending from the viaduct to head for the station. But now, instead I took the broken and cluttered road which runs alongside the bridge: Peto Street. Largely giving access only to the businesses which use the arches as their home, this dusty route is rarely walked it seems. Consulting my older map, I realise that this was once a more important road - but the coming of the graceful Silvertown Way viaduct before the Second World War bridged the chasm which the railway still represents today. Following the curve of the street under a dirty bridge I find myself hemmed in by the walls of Victoria Dock Road. Flanked by railways and the back of a housing development, I miss a chance to cross a footbridge to Tidal Basin Road and I'm forced to walk this way until Royal Victoria DLR station offers a means of crossing the rails. I descend into a surprisingly busy scene. This part of the docks has seen much development: the Emirates Airline Cable Car station touches down near The Crystal - a self-referencing permanent exhibition to sustainable development. Along the dock edge a run of apartments with associated restaurants have appeared. There are people enjoying the warm but brooding afternoon, wandering between cable car and ice cream vans, uncertain of what this is all really for. Across the silver sheet of the dock a low-rise development is flanked by a line of black cranes, preserved for posterity. 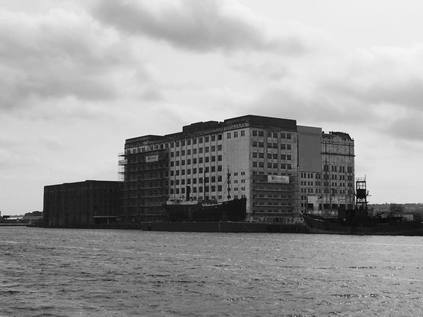 It's hard to imagine the dock during its working life - or even afterwards when it was an empty wasteland, a focus for the Thatcherite project. Now it's part dormitory, part tourist attraction. A theme park of city living. I pause for a while and eat lunch on a bench, watching a grandma and her charges enjoying ice cream near the docks. It's a strange spot, that's for sure. Setting off again, I edge along the dockside, the vast ExCeL centre providing an ominous white boundary. The area is deserted once I'm away from the restaurants and attractions, the exhibition centre is silent and the glass-fronted hotels which dot the area seem inert and reflect my image back at me. Across the dock, Millennium Mills glowers at the redevelopment. Crumbling but stately, this remnant of the old life of the area isn't yet a memorial to the old docks, but it is at least preserved. Beside it, a grain silo is also listed, and the water reflects their curious industrial appearance at me as I walked far enough to get a picture of the Mill. It's hard to ignore this rather beautiful and imposing edifice as I walk back towards the Royal Albert Bridge which allows me to cross the docks here, and I stop and check over my shoulder several times. Once I've climbed the numerous flights of metal stairs to the bridge - complete with graffiti urging the LDDC to fix the lifts - the view is even more majestic. 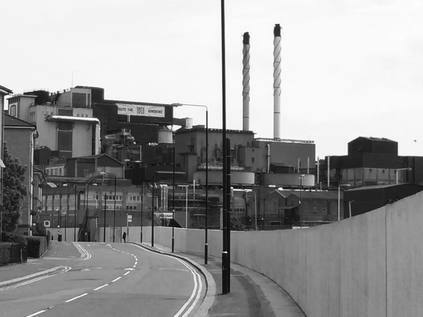 A wheel of prosperity - the City, the Island, the new dockside developments - and then the Mill, and beyond it the shimmering stacks of Tate and Lyle at Silvertown. A small jet pushes down towards London City Airport, the dock water rippling sympathetically. This place is curiously compelling. South of the dock, residential buildings have filled the void left by industry in West Silvertown, with various strata of redevelopment surrounding a few streets of older housing stock. I pick my way eventually onto Mill Road, just such an older street which emerges onto North Woolwich Road near the Fire Station. Ahead of me, beyond the viaduct carrying the DLR, is the tell-tale blue fence of a developer - this is Royal Wharf: "A new riverside village for London". I turn east again, passing the gates of the doomed London Pleasure Gardens, a failed Olympic cash-in which was bound never to work. The public weren't ready to accept the edgeland charms of Pontoon Dock, and the vast canvas of open space was just a dusty, derelict carpark to revellers leaving events at ExCeL. No amount of commissioned art, projected images or expensive bar concessions could change that. Some areas just can't be dusted off - the asbestos is always buried just beneath the surface. Walking across the street and through Thames Barrier Park, it's clear how this area has developed in geometrically-arranged zones as industries have fallen. Hemmed in by residential blocks which have replaced industry, this sliver of green has hardly taken. Despite being well-tended, carefully planted and scrupulously tidy, it feels out of synchronisation with the crumbling and reforming world of dust around it. At the end of the park, the line of the garden is taken up by the barrier - the gleaming silvery hoods extending out into the grey waves. Seen this close it feels like a mysterious craft has landed. The urge is to cross, but that is forbidden. I turn back to the street and notice the forlorn Graving Dock Tavern and George's Diner - shuttered, no longer needed. Not the right kind of café for the aspirations of the area. Around them, the industry which supplied them with trade is gone, concrete footprints are impromptu car parks for vehicles which have fallen off all official registers. The ghost of West Silvertown - or the aspirational footprint of Pontoon Dock depending on your viewpoint - ends at a roundabout. The DLR flies overhead in search of the airport, and the road ahead appears to go where I'm heading - but only if the Crossrail works have preserved the old footbridge over the North London Railway alignment which they now occupy. I'm too footsore to chance a retreat, so I turn north and skirt the edge of a Travelodge car park to get to Connaught Road. For the first time here, the smell of Tate and Lyle's sugar works fully hits me. A thick, sickly coating of the throat which it seems impossible to shift. Somehow more of the farmyard than the sugarbowl. Overhead, the ominous factory implores me to "Save British Sugar" - but it's unclear whether I should be conserving stocks or bailing-out the industry. Down here on the dusty road through North Woolwich I'm caught up against the signature blue hoardings of the Crossrail works. I recall my first visit here, travelling the railway between Albert Road and Factory Road for one last time, marvelling at how broken and otherworldly Silvertown felt. Now I'm here, walking the road which I described as a 'frontier town' on a lazy Saturday afternoon. Nothing appears to be open for business, and noting that I'm starting to flag, I take a seat on a curiously sited bench near the back wall of one of the housing schemes which line the thin isthmus of land between dock and factory. I realise I'm a bit of a curiosity to the locals - the old weatherbitten men off to one of the few pubs still open, or the pram-pushing Bengali women who hurry past me suspiciously. The taint of the factory hangs heavy, and has the same effect as a sugar-induced coma. The area sleeps, insensible to its gradual decline. Resisting the syrupy air, I'm reluctantly on my feet again. I push on seemingly passing an endless stream of closed pubs - the conical tower of the Tate Institute, the footprint and exposed cellars of a once proud but now unidentified pub gone since my last visit, the Henley Arms hanging on by a thread. Beside the road warnings appear for ferry contraband - and I realise that I'm coming to the junction I briefly scouted on foot nearly a decade ago. A new development of apartments and stores runs along the south of the road, few signs of anything open of course. North of the road, the Royal Standard Hotel looks menacingly half-open. Cans and stripshows - no draught beer. Stocked by illicit cross-channel beer runs and staffed by no-one with license. The fenced-off rear doors form a strange little litter-trap, but were once a sort of terrace it seems. I can imagine sitting out here in busier times watching ferry traffic. But now it's quiet. I eye the passing buses with interest, wondering if this is a good place to quit, but decide it probably isn't. So with a last effort of will I cross the street and enter Royal Victoria Gardens. It's calm and cool, and I can get to the river briefly here, the towers of Thamesmead West stepping across the view. The path doesn't hold out long, and despite apparently being available through the Galleons Point development, is gated and locked. Instead I head along the fine brick terrace of Barge House Road and onto the graceful rise of the Sir Steve Redgrave Bridge. Stopping as I cross, a chance to look back across the territory - the hills of Kent are green and dark behind the silver strip of river, Tate and Lyle dominates the skyline like an alien presence, meanwhile the airport runway sweeps along the dockside with the wind howling in from the sea. The docks are a strange place, contested and unquiet despite their disuse. As I picked my way carefully to Cyprus Station, avoiding the knots of students wandering around the University campus I reflected on my walk. It had been long and tough on the feet, but I'd made so much sense of this area by walking it at last. Endless crossings by DLR and excursions by rail had hinted at its nature, but couldn't reveal how strangely compelling it is. The history of this place, the strangely isolated nature of its community and the sorry tale of development which excludes those here longest haunted my journey home. It's fair to say I'll be walking more in this zone - in the parts of the East I used to think of as beyond the pale. For David John Newman 03/07/1945 - 14/05/2015 and Antoinette Jean Newman 09/11/1949 - 18/04/2014. Never forgotten. A gallery of images from the walk is here. You can read more about the many pubs in this area which are no longer around here.